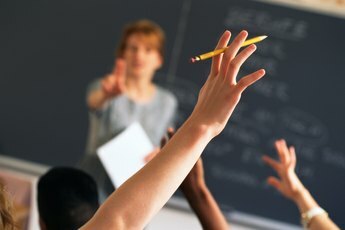 During the first few weeks of school, some children need coddling. The preschool experience prepares children for elementary school. Life suddenly makes sense outside the home when a child's preschool teacher successfully melds academic, social and emotional lessons throughout the day. According to the U.S. Bureau of Labor Statistics, 570,400 preschool teachers across the nation nurture children through developmental play, repetition, cause-and-effect lessons and reinforcement of fine and gross motor skills. Preschool teachers arrive about half an hour before class begins to set up and arrange activities. Teachers hang up the previous day's class work and distribute papers and projects to cubbies for children to take home. On the play yard, teachers might set up paint, easels and colored chalk; distribute sand box toys and bikes; place the day's music into the CD player; and wipe down the slides from the morning mist. At the end of the day, teachers put rest mats away and wipe down tables. They also sort and disinfect supplies, tidy play areas and, when necessary, phone parents. When school starts, the race for attention begins. "I'm often wiping a boogery nose, greeting parents and children, bandaging a child's scrape while listening to a another child's tall tale from the previous day, and rushing to the bathroom before a child pees on my foot ... again!" explains Lisa Feliciano, a Los Angeles-area preschool teacher with 17 years of experience. 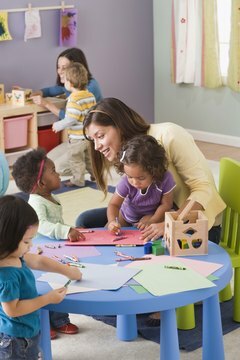 Preschool teachers pay attention to everything from how a child interacts with others to his ability to follow directions and take turns. Teachers assess student safety during projects and outside play and monitor cognitive, language, physical and emotional milestones during activities such as jump rope, writing and singing songs. Parents are in constant communication -- at sit-down meetings or when they are dropping of their children at school -- with the teacher to discuss issues ranging from the death of a pet to divorce or a child's fear of the dark. 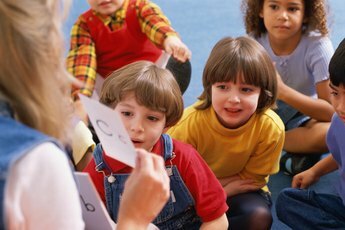 Teachers teach students social and communication skills, such as sharing and listening when their peers talk. To teach math and reading, preschool teachers use play activities, such as setting up a grocery store and having students "shop" for five items. While preschoolers do not receive letter grades, teachers still must document their students' progress through attendance records, projects and assessment results. Regular parent-teacher conferences help ensure that parents and teachers agree on a child's learning needs. Discussions include development milestones and a child's particular strengths, interests and abilities. The teacher goes over assessment results and may inquire about behavior at home and suggest at-home activities. In addition, teachers meet with the preschool director once a month to go over curriculum, talk about their students and discuss manipulative objects the teacher would like in her classroom. The director often evaluates the teacher's performance. Also, teachers attend staff meetings to discuss budgets, child care policies and upcoming events. 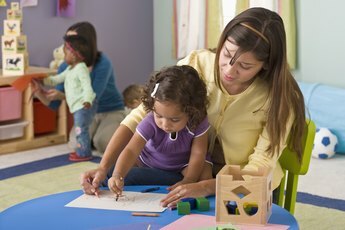 Preschool teachers earned a median annual salary of $28,790 in 2016, according to the U.S. Bureau of Labor Statistics. On the low end, preschool teachers earned a 25th percentile salary of $22,750, meaning 75 percent earned more than this amount. The 75th percentile salary is $38,350, meaning 25 percent earn more. In 2016, 478,500 people were employed in the U.S. as preschool teachers.